That being said, the ASUS ROG STRIX SCAR II GL504 makes significant improvements with the screen, the battery and the audio along with some RGB voodoo. All of which, makes it stand apart from the crowd. With the upcoming 20-series mobile GPU launch right around the corner, most laptop manufacturers are taking it slow. 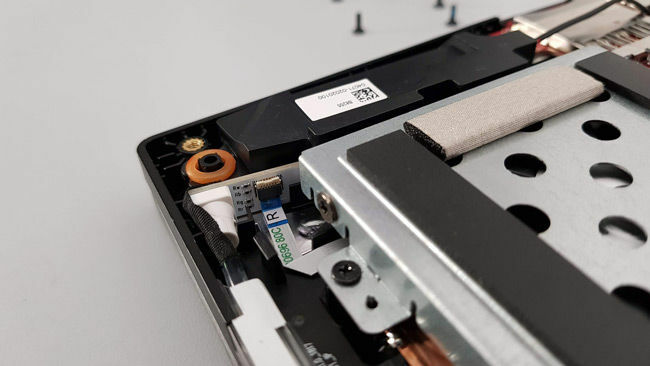 Newer SKU are only being introduced for the sake of emptying component inventory. Then there’s ASUS which is still pushing for more features that benefit the gamer-on-the-go. 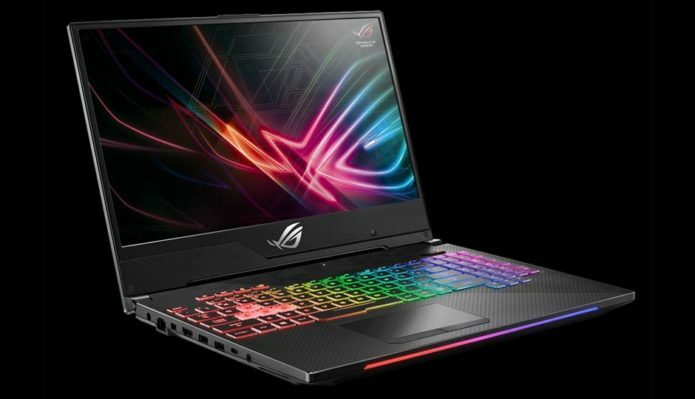 The ASUS ROG STRIX SCAR II GL504 Gaming Laptop was shown to all at COMPUTEX 2018 and launched within a similar time frame overseas. 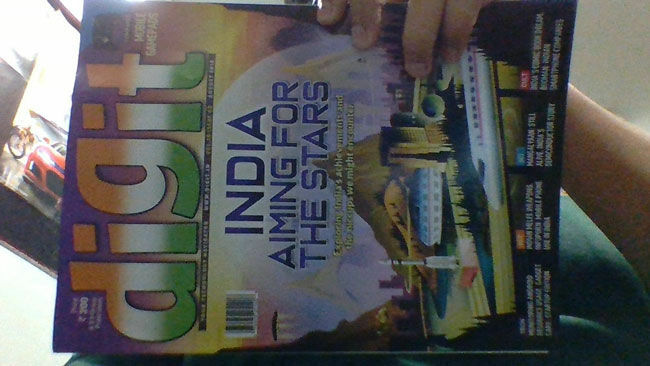 Today we’re seeing the India launch for the same. As with the previous generation, the GL504 comes in two variants, the Hero and the Scar. Let’s take a look at the specifications of the Scar II. The ASUS ROG STRIX SCAR II GL504 is powered by the Intel Core i7-8750H and an NVIDIA GTX 1060 6GB SKU. This isn’t the MAX-Q variant of the GPU so it’s better in terms of performance. ASUS has SKUs with the GTX 1070 for both, the Scar II as well as the Hero II for Rs.1,79,990 should you want a bit more firepower. 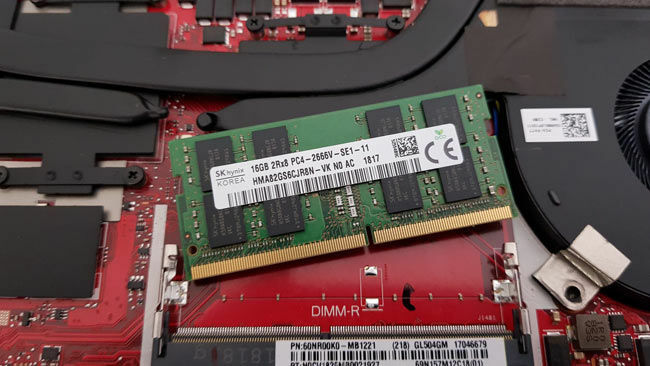 The Indian SKU has just one 16 GB DDR4 DIMM which is a bit of a disappointment given that there is a performance loss when the memory runs in single channel. There is a noticeable price difference between the a 2x 8 GB configuration and a 1x 16 GB configuration, so perhaps that’s where a bit of money has been saved. We’d advise you to get another 16/8 GB module just to get double-channel working. 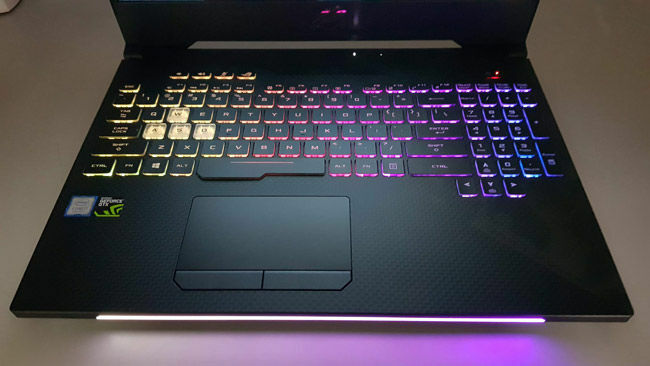 The SCAR II has a familiar top-shell texture that we’ve seen on many of ASUS gaming laptops, the most recent being the Zephyrus gaming line. The direction along which the brushing is done varies from model to model, sometimes the texture is a bit different. 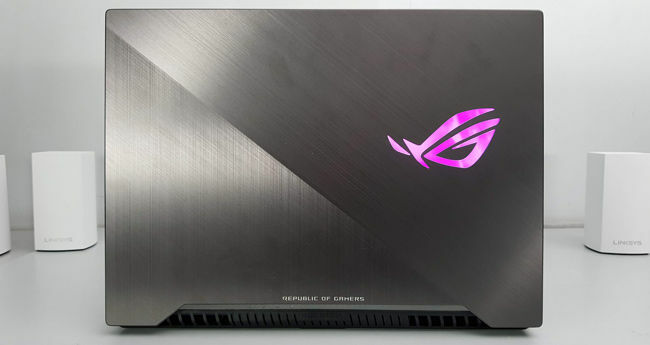 With the ASUS ROG STRIX SCAR II, the noticeable change is the ROG logo which now has RGB instead of just being stuck with red. Red went with the whole ROG design language but with almost everyone in the market opting for the red and black colour scheme, there’s little that brands can do to retain this aspect of their identity. Now let’s peek at the underside, we find a single hatch instead of a multi-shell design. This helps save money and reduces complexity. 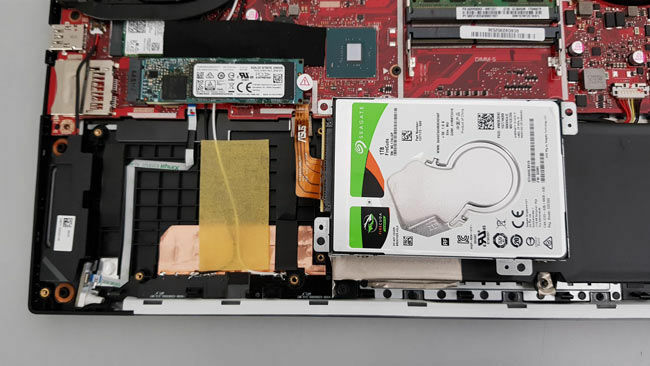 However, the downside is that folks with no experience with opening up a laptop can mess things up and you would inadvertently lose warranty coverage if you damage the unit in such a manner. Coming back to the hatch, we find cooling vents on either sides of the cooling fans and there are no openings on the bottom for the speakers. Instead, they’re aligned to the sides. Opening up the SCAR II is fairly easy, there are no screws hidden underneath the rubber pads and you don’t need any fancy screwdriver bits. With the hatch open, we see that the vents don’t open up right on top of the fan intakes. Doing so does impede cooling to a slight extent but the upside is that you won’t be pulling in too much dust. So you can go for a longer time before needing to clean the fans. One of the things we noticed was that the openings of the vents were also pretty huge so the chances of alien bodies coming in contact with the internal circuitry via these openings is high. One good thing implemented to mitigate such a disaster is the additional coverings placed on the sensitive equipment. These not only serve to prevent dust collection but also serve to protect the components from anything poking at them. SMT components are easily knocked off their pads. 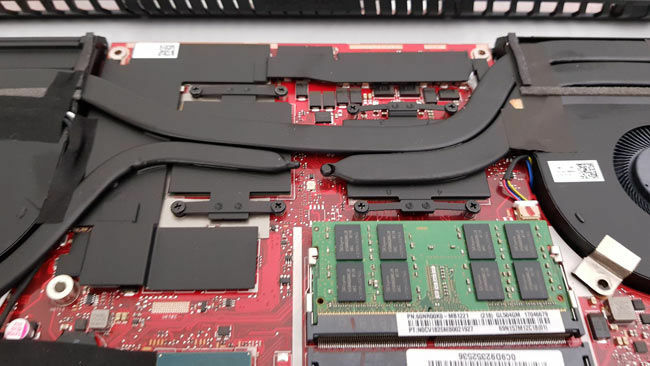 You have no doubt seen the single RAM DIMM in the previous photos. Here’s it up close. It’s an SK Hynix 16 GB module rated for 2666 MHz but because there’s only one DIMM, you are running at single channel. So performance is affected here. As for the storage, the SCAR II uses a Toshiba XG3 256 GB SSD in combination with a Seagate FireCuda 1 TB SSHD. 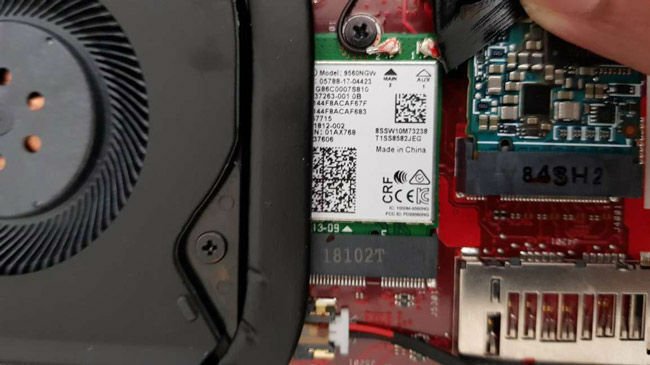 The former is a pretty good SSD that’s mostly used in by OEMs for its price/performance offering while the latter is better than getting a normal hard drive. 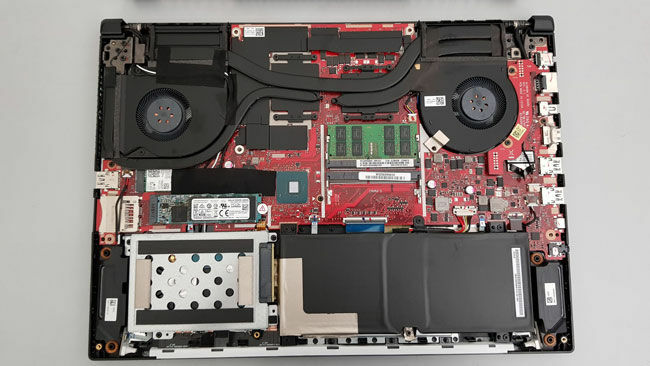 After pulling the drive out we can see one of the antenna leads from the Wi-Fi module snaking towards the front of the laptop. Also, the SSHD is seated in a drive caddy with foam padding on the bottom side but there’s little to absorb any untoward impact shocks that might travel to the drive via the screw mounts. As mentioned previously, the speakers are oriented sideways and do have rubber rings to prevent any chattering when running at low frequencies. Lastly, here’s a look at one of the most prominent visual addition that ships with the SCAR II, the front RGB strip. It’s quite bright and adds a nice look to the device when there’s a moderate amount of ambient light, however, in low light it tends to become a nasty distraction. So much that we night-owls turned it off for the most part. Now that we’ve taken a peek on the inside, let’s take a closer look at the keyboard, interface options and the display panel. 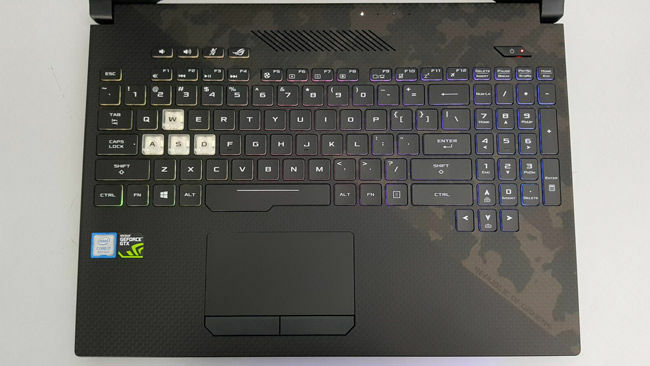 The ASUS SCAR II GL504 has a carbon-fibre pattern running across the entire C-panel with a camo print overlay on one half. This split is just like what we saw on the topside of the lid with the two brushed metal finishes. The camo is very faint and doesn’t come off as garish. 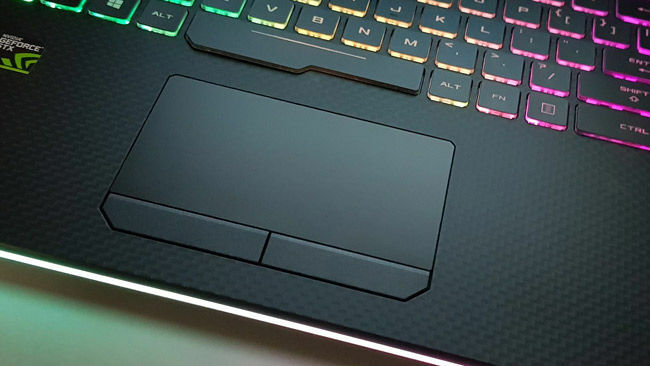 We can also see the dedicated audio buttons along with the hotkey for the ROG Gaming Centre on the top and more intake vents bang in the centre. There’s a proper numpad on the SCAR II which is always something to look forward to. And the arrow keys jut out by one row which makes them easy to find without looking down. With non-standard layouts like what we see here, having such markers helps with the overall user experience. 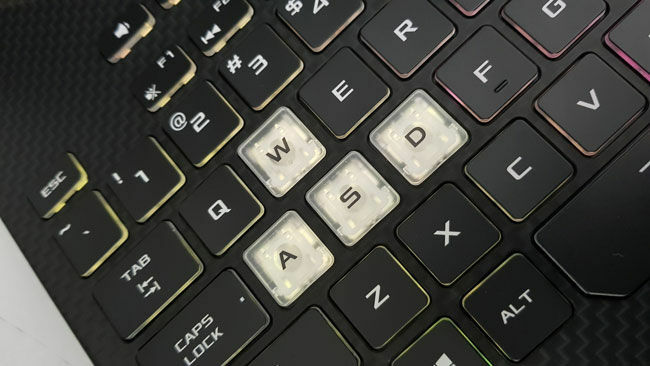 Speaking of markers, the WASD keys are translucent so you’ll see them no matter what. However, just like the RGB strip on the front, these tend to be a little in your face. 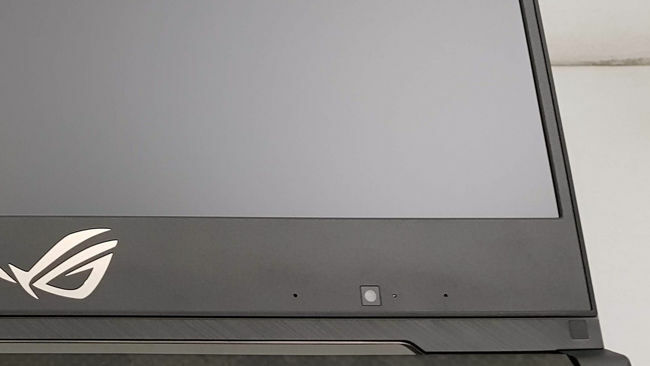 Lastly, we have the trackpad with physically distinguishable buttons for the left and right click. One one hand, these make working with the laptop way better than a unified panel but they also tend to start wiggling with age. We don’t know how these will fare over time. As for the texture, it’s obviously got a matte texture and it was a delight to use. We didn’t face any stickiness even when using slightly moist fingers so that’s always a plus point. Maybe this being a gaming laptop, we should give it a go with some Cheeto dust and see how that works out. The ASUS ROG STRIX SCAR II GL504 offers a nice mix of I/O options. On the right side we have an SD card reader, a USB 3.0 port and a kensington slot. While on the other side we see power, ethernet, DisplayPort, HDMI, CTIA audio jack, 2x USB 3.0 Type A ports and one USB 3.0 Type-C port. The problem here is the massive vent on the side. We assumed that this might have been an inlet but upon running the first benchmark, we felt the hot air blowing right onto the hand. This was confirmed when we opening the machine up and saw the fans blowing out from both sides. As we’ve mentioned countless times, the right side is where most gamers have the mouse, so hot air blowing out of that end isn’t favourable. 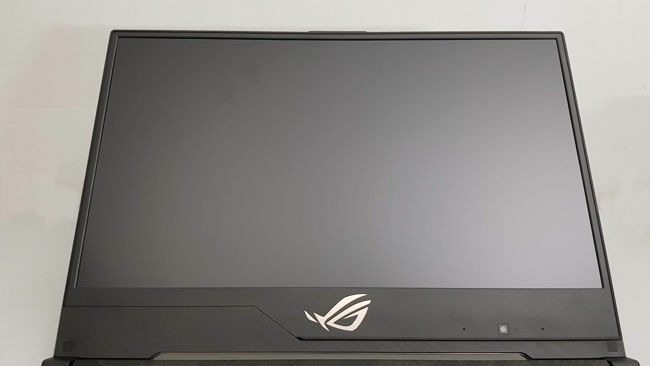 The ASUS ROG STRIX SCAR II GL504 has a 15.6-inch IPS panel running at FHD and like the previous SCAR, this too has a 144 Hz refresh rate. 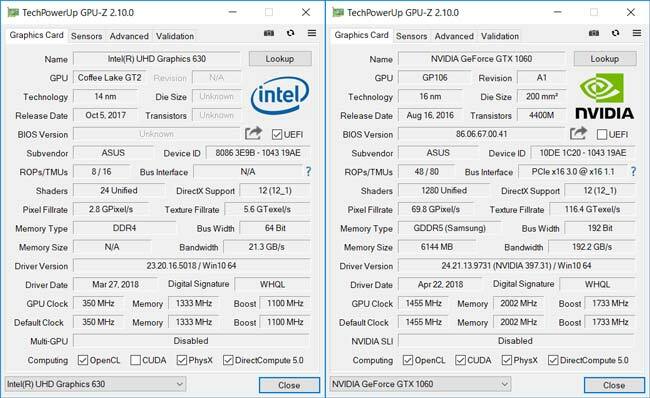 This time around, there’s no G-sync. A GTX 1060 isn’t going to push the upcoming games to the level that would benefit from such a fast panel but when you’re thinking of competitive titles, then a 144 Hz panel is certainly a welcome feature. The bezels are really thin on the SCAR II. Even the top bezel has been shrunken down to the same level by moving the webcam as well as the microphones down and towards the right. 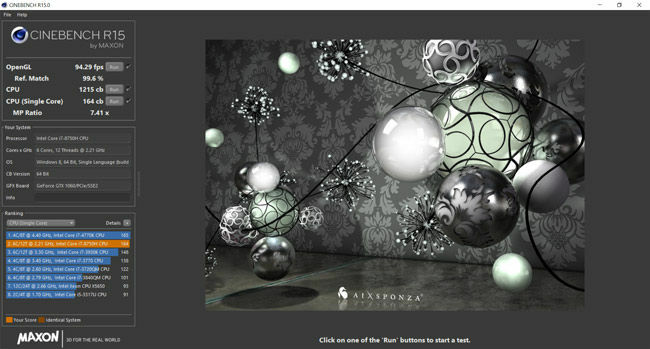 The off centre arrangement is a bit weird but that’s the cost of trying to fit a webcam while maintaining thin bezels. The panel is made by AU Optronics and has a brightness of 300 cd/sq.m with 170 degree viewing angles along both axis. The sub-pixel arrangement is vertical RGB and the contrast ratio is about 800:1. Coming to the webcam, there appears to be a significant downgrade for a laptop that costs 1,39,990. Here’s a sample image in moderate lighting conditions and you can see the ridiculous amount of noise and lack of definition across the entire image. The lid opens up by 130 degrees. While we don’t have any particular favourable range but anything above 120 degrees is good in our books. The panel is quite well sealed off, there’s hardly any bleed which is consistent with most laptops in this price bracket. 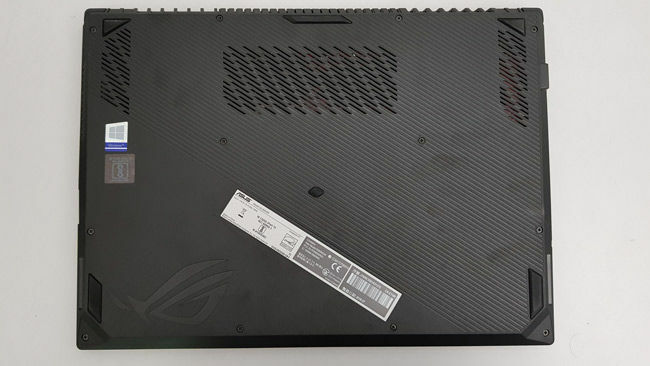 We’re looking at a very common configuration with the ASUS ROG STRIX SCAR II GL504. The Intel Core i7-8750H coupled with 16 GB of DDR4 RAM clocked at 2666 MHz ensure a pretty high headroom for most mundane tasks. Then there are the two options with GTX 1060 and GTX 1070 based on how much eye candy you want to enjoy in AAA games. We started off with CineBench R11.5 and R15 and the ASUS ROG STRIX SCAR II GL504 scored 11.4 and 1215 in those benchmarks, respectively. 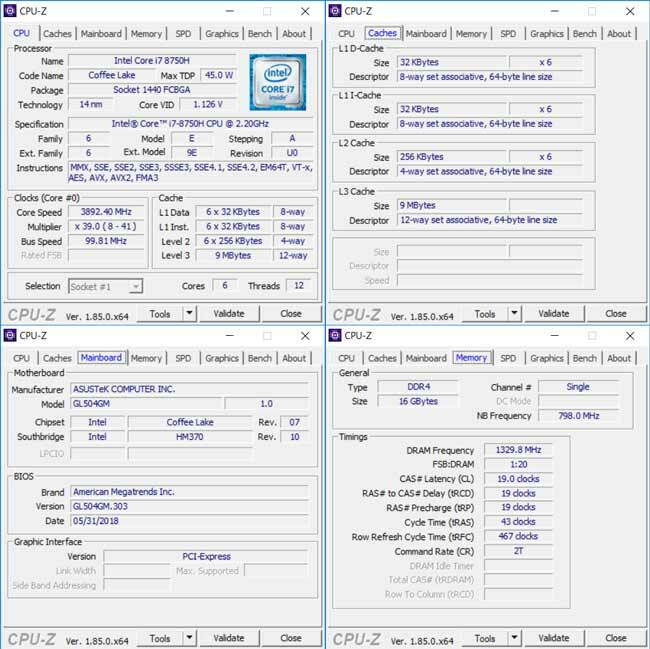 WinRAR’s compression benchmark scored 12770 KB/s which is very similar to other 8750H powered laptops that we’ve tested earlier. As for PCMark8, we used Accelerated to leverage the GPU and ended up with a score of 7760 on PCMark8 Creative (Acc. ), 5374 in PCMark8 Home (Acc.) and 5548 in PCMark8 Work (Acc.). For Wi-Fi and Bluetooth, the SCAR II makes use of the Intel Dual Band Wireless-AC 9560. As mentioned, it’s a dual band 802.11ac adapter with MIMO enabled. We used iPerf to see how well the add-on card fared over the ‘ac’ band. We managed to get 523 Mbps on the throughput and about 69 Mbps via a single stream which is more than sufficient for gaming or otherwise. It doesn’t feature a separate QoS solution to prioritise traffic, but you can always install one yourself and get the job done. The Toshiba SSD may be a bit low on capacity for with read speeds hitting 2130 MBps and write speeds of 1125 MB/s, it makes your overall experience very fluid. It is an NVMe drive (duh!) and has a good set of characteristics overall across different file sizes. It’s accompanied by a Seagate 1 TB FireCuda drive which itself is aanSSHD. While performance benchmarks such as CDM cannot get the most of SSHDs because it depends on frequently used files being cached, we don’t get the real picture. However, if you were wondering about the pure performance, then here’s a good estimate. The Intel Core i7-8750H along with the GTX 1060 make for a balanced configuration for serious gamers. Most of the current AAA titles run with ease and the older competitive titles do even better. 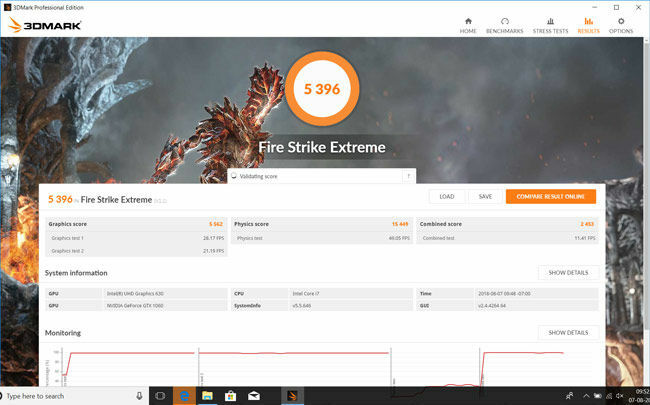 Coming back to what we have on hand, we started with the trusty 3DMark with the latest NVIDIA drivers. We managed to get 10372 in Fire Strike, 5396 in Fire Strike Extreme and 2765 in Fire Strike Ultra. Moving on to games, Rise of the Tomb Raider scored 64 FPS with all the settings cranked out and BioShock Infinite managed to hit 114 FPS. We tried playing Strange Brigade as well but there were certain issues in the beta so we’ll leave that be. For the price of 1,39,990 for the GTX 1060 SKU, the ASUS ROG STRIX SCAR II GL504 is priced to sit right in the midst of all GTX 1060 + Intel Core i7-8750H SKUs such as the MSI GL63-8RE and the Acer Helios 300. The MSI laptop costs lesser and the Acer one costs more. The thing of note with the GL504 here is that it offers a nice mix of features that strike a balance for the price but bears more on the expensive side. 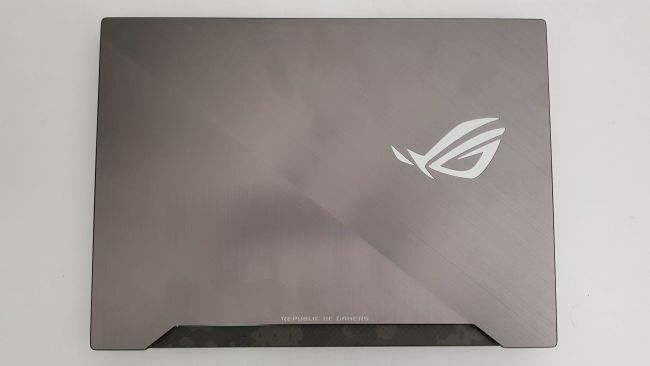 The ASUS ROG STRIX SCAR II GL504 is the result of ASUS listening to user feedback. The first-gen GL503 wasn’t a bad laptop at all. In fact, it was a nice change to see a manufacturer add more value to an existing lineup by specialising laptops based on the genre of games that the consumers tend to play. With practically everyone in the market providing the exact same hardware, there arises a need to add more value and with such SKUs that are built for a genre, ASUS is filling that void.